Testimony • Napolitano tells a Senate panel more fencing may not add security; Lee worries immigration plan wouldn't stop illegal crossers. Washington • Immigration reform may not result in much, if any, new border fencing  despite $1.5 billion in designated funds in the Senate proposal, Homeland Security Secretary Janet Napolitano said Tuesday. 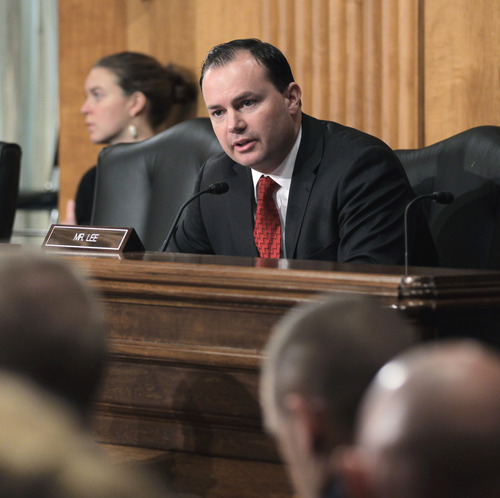 Sen. Mike Lee, R-Utah, pressed the secretary on the issue, noting the proposal would give her the ability to certify when the border fence is complete. The fence plan is one trigger that would allow many of the 11 million immigrants in the country illegally to gain access to green cards. "If you determine little or no additional fencing along the border is necessary, when do you think is the soonest that you might certify that that has been completed?" Lee, an opponent of the proposal, asked Napolitano. "I think we would move very quickly," she responded. "We have not been sitting back waiting for immigration reform to pass to secure the border." Napolitano, a former Arizona governor, noted a U.S. Border Patrol study determined a fence makes sense on 653 miles of the 2,000-mile southern border and so far some sort of fencing is up on 652 of those miles. "I think what we would do if the bill passes," she said, "is go back and look at the type of fencing we have and say, &apos;Do we want to make it triple what it is or taller?&apos;  or something of that sort." In an interview after the hearing, Lee said he didn&apos;t have the technical expertise to question the secretary&apos;s analysis of border fencing, but added he&apos;s worried that the legislation sets a low bar. "It is not something that necessarily guarantees that the border is adequately fenced in the long run," he said. 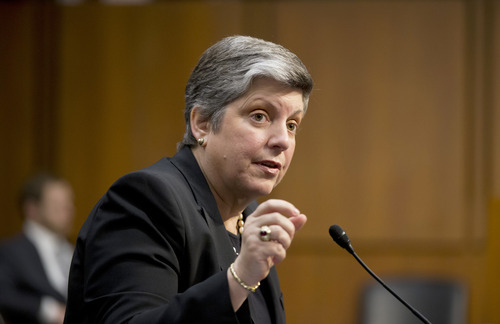 Napolitano appeared before the Senate Judiciary Committee on a third day of immigration-related hearings. She was slated to appear last Friday but delayed her testimony because of the ongoing investigation into the Boston Marathon bombings. The senators largely praised her and her agency for the work on the attack before jumping into the details of a broad immigration-reform plan that involves border security, employment verification of immigration status, and a process to grant legal status to immigrants here illegally. Much of the questioning centered on border security and fencing, with Judiciary Chairman Patrick Leahy, D-Vt., expressing pessimism about building a longer fence, arguing that apprehensions of illegal border crossers are down. "I question whether spending billions more on a fence between the United States and Mexico is really the best use of taxpayer dollars," he said. 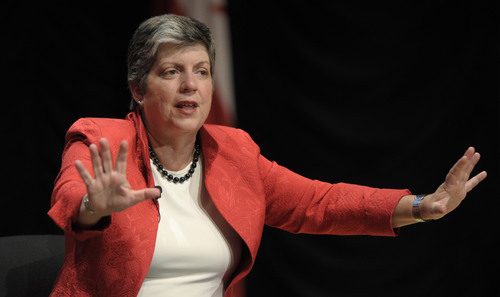 Napolitano said she hopes to be granted flexibility to tap $1.5 billion now designated for border fencing on other border-security equipment, such as unmanned aerial vehicles. Sen. John Cornyn, R-Texas, agreed with Napolitano on the point, but questioned how the government could claim to have "effective control of the border" unless it knew how many people slipped through undetected. She argued that better surveillance technology will make that determination more accurate, but noted no number will determine the level of border security. Sen. Orrin Hatch, R-Utah, and a potential swing vote on immigration reform, has credited President Barack Obama&apos;s administration for doing more to boost border security than any past president and said the immigration proposal could be enough to settle the politically difficult issue, as long as everyone agrees that there is no reasonable way to create an impenetrable border. Hatch, a Judiciary Committee member who was helping lead another hearing Tuesday, only temporarily attended the immigration discussion and did not ask Napolitano any questions. The committee is now expected to debate and vote on potential changes to the bill in May. If passes there, Senate Majority Leader Harry Reid, D-Nev., wants to bring it before the full Senate in June.